It's time for summer vacation! Although I'll be traveling for the next few weeks, Family Sleuther is still hard at work. I'm turning things over to my aunt and mother who have both graciously agreed to share family history gems in my absence. This week's post continues a recurring series featuring the reminiscences of my maternal aunt, Diane. 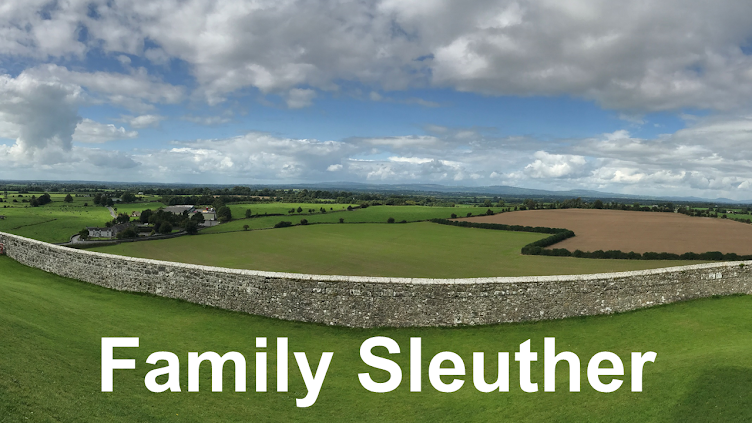 A longtime genealogist, her years of family history detective work piqued my own curiosity, which laid the foundation on which Family Sleuther is built. 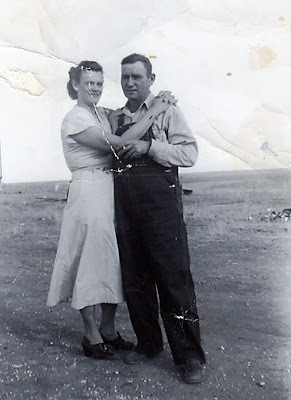 This week, Diane takes us back to a time when farming the Kansas prairie was difficult work with few modern conveniences, but work that grandpa loved dearly. I grew up in Lakewood, Colorado. My mother's family was from the farming community of Plainville, Kansas. When I was a child and up through high school, I was able to come to Kansas and stay with my grandparents. It was the highlight of my year. I liked the laid-back small-town. And I really loved my grandparents. In 1978, when I was 25 years old, I packed up, left Denver and came to live near my grandparents. I didn't think many 25-year-olds still had both of their grandparents living and I wanted to live near them and bask in their love. Years later, after I had married, I remember one beautiful day driving east out of Plainville on K-18 Highway. In the field to my right was a really fancy tractor. It had a completely enclosed cab and most likely power steering and an air conditioner. I watched for a few moments and remarked to my husband, "I like the way grandpa did it better." I have often thought of that day and allowed memories to take me back to a more simple, yet harder time. In the 1950's grandpa had a green John Deere Tractor. To a little girl and her little sisters, it was massive. There was nothing better than grandpa pulling us up on the deck of the tractor and rolling down the yard a short way. If there was just one of us we were in his lap. I loved everything about that old tractor especially the metal seat. 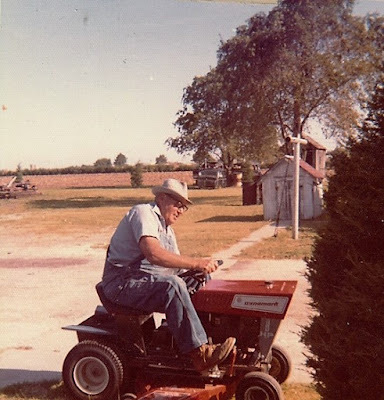 Grandpa did his farming years before fancy tractors and combines came on the scene. There was no air-conditioned tractor for Grandpa and he didn't have an umbrella to shade him. But he did have a dust-caked straw hat. And he had a Gott aluminum water cooler that he filled and took to the fields with him everyday. On particularly hot summer days, which is everyday in Kansas, grandma would say, "Let's take your grandpa a drink." Off to the DQ we would go and bring him either a root beer or lemonade. We would drive several miles east of Plainville and then back north and then east. Grandma would drive down the Country Road until she saw him, pull to the side of the road and give the horn a couple of toots. Then we waited while he turned another row or two of dirt. Grandpa made his way to the window of the car, pushed his straw hat back and with a "whoee" accepted the drink and swallowed thirstily. Farming was nothing new to grandpa. As a boy and a young man he worked in the fields where his mom and pop farmed. Pop was grandpa's stepfather who always treated him just like his own son. Grandpa met my grandma when he went to work for her dad shucking corn for a dollar a day. He continued farming for the next 40 years. Of course, he advanced from shucking corn to plowing, planting, and harvesting his own crops. After grandpa quit farming, he focused on his yard and the large garden that he planted. I remember being at his home when grandpa pushed his new Little Red Riding Mower out of the shed. Out it rolled to his low voice saying, "Come here you beautiful baby." Even retirement couldn't take the farmer out of the farmer. I enjoyed your Aunt Diane's piece about her Grandpa. Have a nice vacation, Michael. Thank you, Cathy! Looking forward to catching up on all of the family history blogging when I return in September. This really hits home. Although I'm pretty sure my Dad was grateful for an air conditioned cab! Many times as a kid we took lunch to the field about 4:00 - especially during harvest. Aunt Diane is a great choice to fill in for you. Have a great vacation! Thank you, Laura. Aunt Diane will love hearing your comment. And I would definitely need the air conditioned cab! Michael, I love these photographs. The story was written in an intimate way, you can feel the affection for these Lumpkin grandparents. Thank you for sharing it. Thank you, Janice. I’ve always loved my aunt’s storytelling and am so glad she’s writing our family history for my blog. Gonna miss you "BlogHusband", but it is a well deserved vacation. I know your Momma and Auntie is gonna take good care of your Blog. Grandpa looks like a ham. I would of loved to been on that farm. I remember when Daddy got into his 90's and Uncle Harvey had to start mowing his lawn. Afterwards he would get out the broom and that was the best he could do to let himself know he was still kicking. Great lawnmower! Great Memories! We should all be so fortunate as your Daddy, True! Sounds like you’ve got some good genes in your DNA. Two more glorious weeks of vacation and then back to blogging (although I’m thoroughly enjoying sharing this gig with mom and my aunt).